As this is my blog, pretty much everything I write is my own personal opinion. 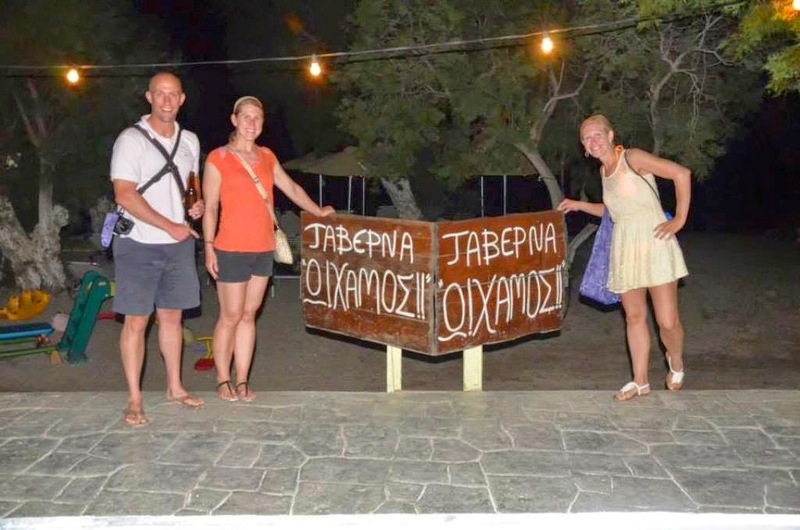 Since our trip in Greece included three other people, I felt it only necessary to get some feedback from them. Each of them took the time to answer a few questions, and I want to share that with you. What was your favorite island? BECCA: Milos, small and quiet. Loved the white buildings with blue accents. ERIC: Corfu, but Milos is very close. LUKE: Hard to say. There was the most to do in Corfu. I had the most fun in Milos, and loved how it was quiet and not packed with tourists. Would like to go back to Santorini and see/do more. DEBBIE: Milos... it was very peaceful, but fun, things were cheap, not many tourists, and exactly what I pictures a Greek Island to be. BECCA: Perissa beach (Santorini)... black coarse sand with flat bottom in water. Papafragas (Milos)... the one that Luke looked like he was about to fall off the cliffs. Canal d Amor (Corfu)... the rushing water waves were mesmerizing. ERIC: I really liked the last beach Perissa with the rock bottom. The sand wasn't too hot and it was nice and quiet. DEBBIE: Sarakiniko. It was like the moon! The water was warmer than other areas - it was one of the busier beaches we went to, but it was still so quiet. What was your favorite activity/excursion? BECCA: Loved the wine tour, especially the last stop (Gaia) right by the quiet beach. Loved the Catamaran, the food was great and the views from the sea was beautiful. Loved the Sunset in Oia! ERIC: I enjoyed the wine tour. It was very informative. 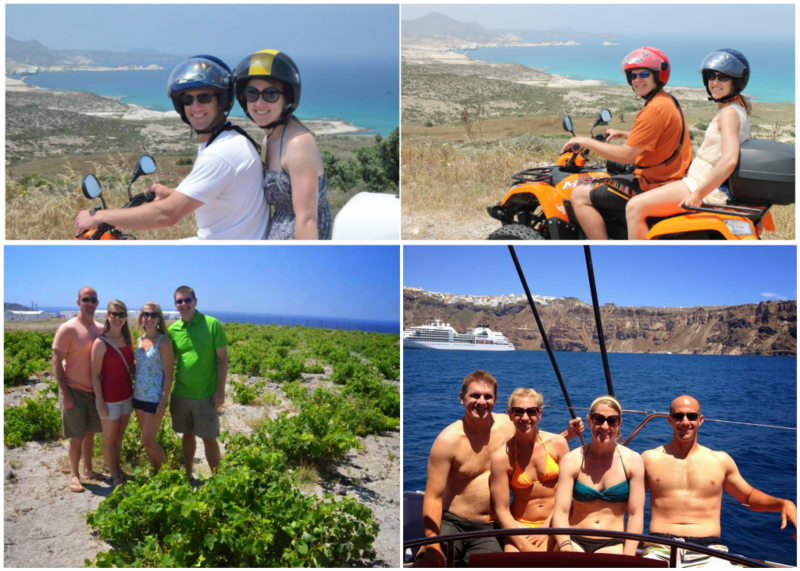 LUKE: Riding ATVs all over Milos & Santorini. DEBBIE: The ATV's were fun, although sometimes I was a bit frightened for my life. What was your favorite village? BECCA: Plaka (Milos)... probably because it was the middle of the day, but it was so quiet and peaceful. And colorful! ERIC: Fakime was a great stop along the way in Corfu. JK I really liked Paleokastritsa on west side of Corfu with the curvy mountain roads and quiet. Wish we would have had more time to look around and find spots like Akron restaurant and La Grotta. LUKE: Um...I guess I'll go with Fira in Santorini, if that counts as a village. If not, the one in Corfu near where Eric & Becca jumped off the rocks at El Grotto. DEBBIE: Plaka in Milos. Exactly what I imagined a Greek village to be. BECCA: O Xamos... in Milos. Loved the greek soul food restaurant style!! ERIC: Loved the restaurant in Milos our last night (O Xamos). Also loved the restaurant in Corfu next to apartment (Leonidas). The Cork Bar in Corfu was good also the first night. DEBBIE: Tough one - Mikros Apoplous in Milos had the best Tzatziki. O Xamos in Milos was the most unique restaurant, and I'd recommend it over any other. But Leonidas in Corfu was super tasty and super cheap! What is something that you will remember forever, that sticks out in your head more than anything else? BECCA: Loo paper in the rubbish bin... Everything was so colorful! So many flowers and plants (especially bougainvillea) highlighting the white buildings with blue accents, plus the blue sky every day!!!! 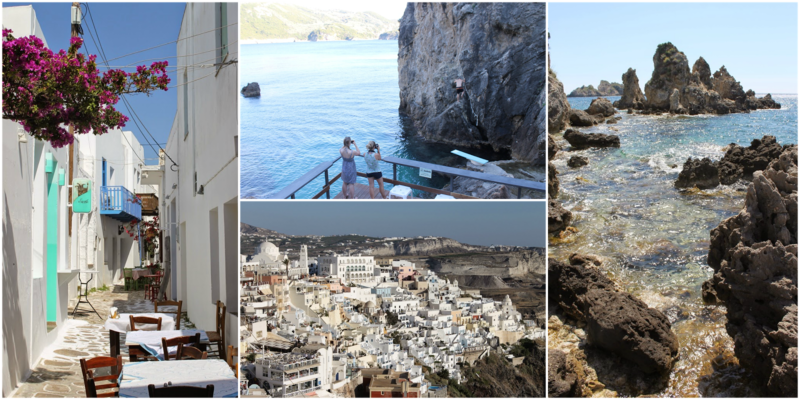 ERIC: The darn west side of Santorini! Sarakino in Milos was awesome though, and so different. Wish we had been there longer and swam more. LUKE: Driving ATVs on the side of a cliff on the windy roads in Santorini at dusk. I literally felt like I was in a dream. DEBBIE: 8:30-8:40pm on June 11-13 2014, the sunsets in Santorini is one of the most beautiful things I have ever witnessed. 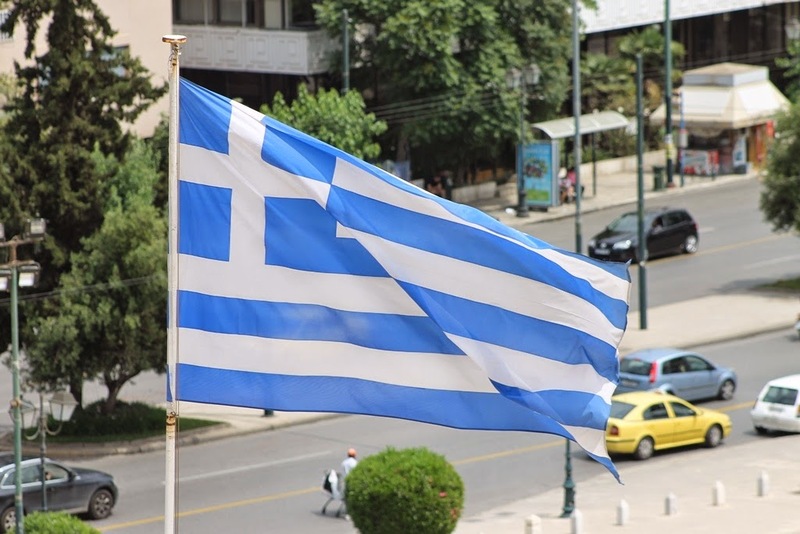 What piece of advice do you have for someone who plans to visit Greece? ERIC: Go to a remote island and relax (Milos, Corfu, somewhere that isn't a well beaten trail). 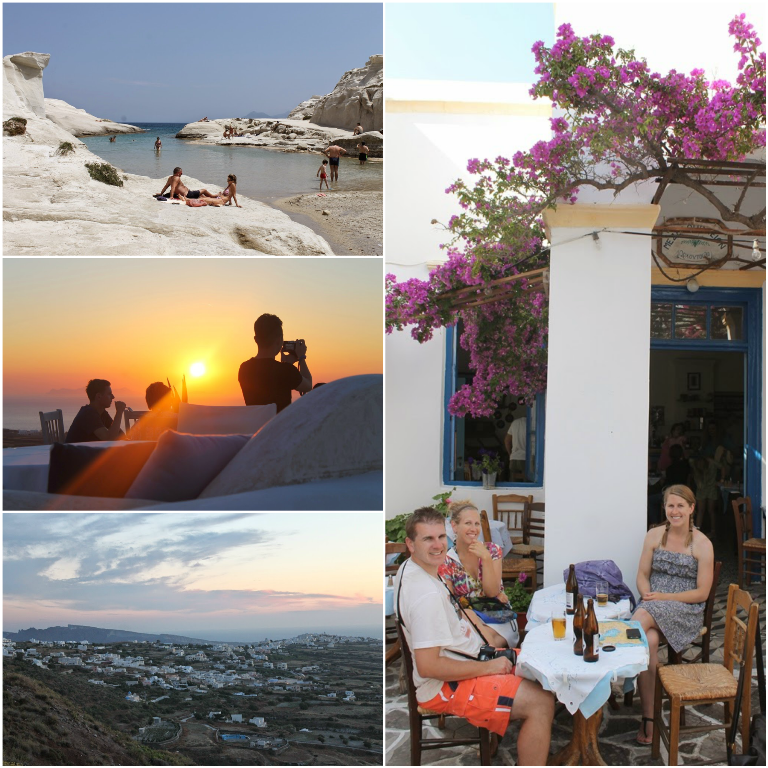 Avoid the heavy tourist areas as there are other islands and sunsets just a beautiful as Santorini. Eat the fried cheese (saganaki)! Explore the island and find the little old man who makes his own wine and olive oil. Don't try to buy his whole table of oil and wine. LUKE: Bring me with you. Well folks, that FINALLY wraps-up our whole Greece trip. 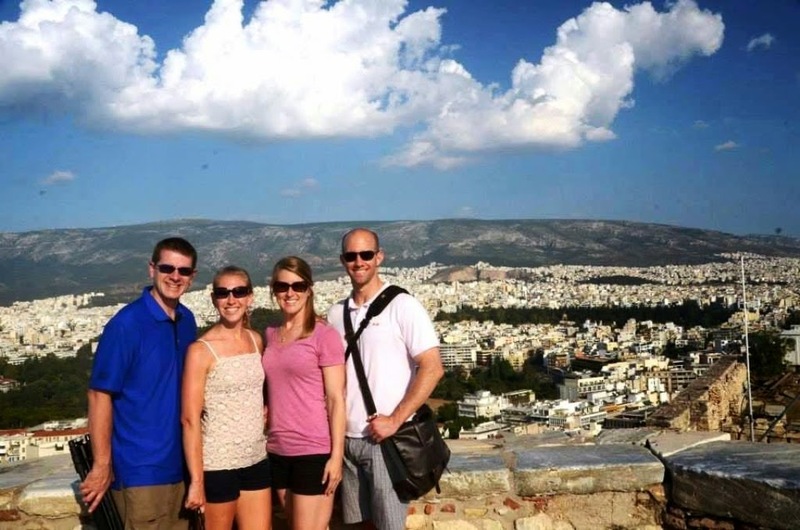 I can safely say that Greece is my favorite country that we have visited! The food was amazing and the weather was perfect, but I especially loved the company! Greece has 227 islands that are inhabited, but there are many more (6,000+) that are owned by the country.